WaveFlat is a clean and modern Woo Commerce theme, designed with a fresh flat style and with a great responsive and retina-ready design.Its uniquely flat design, beautiful parallax effect and dynamically smooth animations provide you a simple and modern look on all devices. We are authors of a lot of powerful and flexible themes like WaveMetroPro, WaveClean, WaveNews and WaveClear. Our themes are best sellers here and we have thousands of happy customers. You can trust us. So, believe me: With WaveFlat you get a lot of unbelievable features. There is no limit to what you can accomplish using WaveFlat. Add countless shortcodes from Slideshows to new blog layouts within a powerful drag and drop Page Builder. Modify options and settings via WaveFlat’s robust Admin Panel. Change your site colors and control your layout with point and click options. Choose from different layouts and templates on a page-by-page basis or Start creating a whole new layout. 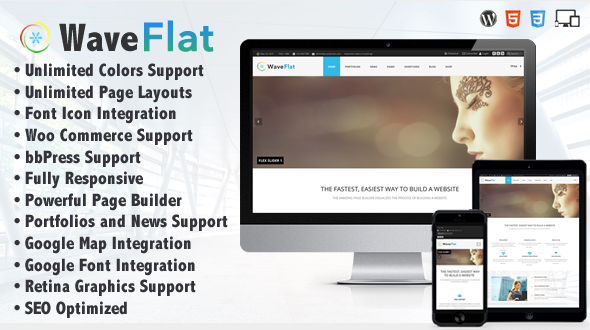 You can create either standard Multi page websites or One page websites with WaveFlat. Its smart and hand crafted environment allows you to Build outstanding websites easy and fast. Please note, the Demo file does not include the original images.The sample images viewed in the live preview are for demo purposes only and are not included with your purchase. change the short code structure and page builder. Update the Woo commerce to support V2.2.8. Fix some CSS display issues. Add Edge Slider in the theme, support video and image in the slider. Add page banner video support. Update the style of short code in view editor for WP version large than 3.8. Make it the same with the old WP version less than 3.8.
change the short code structure and page builder. Update the Woo commerce to support V2.2.8. Fix some CSS display issues. Add Child Theme Add Edge Slider in the theme, support video and image in the slider. Add page banner video support. Update the style of short code in view editor for WP version large than 3.8. Make it the same with the old WP version less than 3.8.